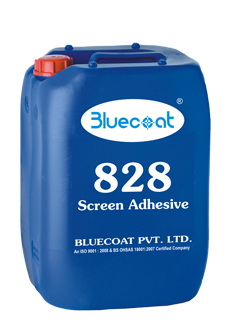 Bluecoat 828 is a Screen Adhesive used for fixing bolting cloth on metal frame fortextile screen printing. It aids in fixing the bolting cloth strongly to the frame. The screen dries faster, hence saves time. Keep the container closed 8-away from Sunlight. The material is inflammable, keep away from smoke, fire or any source of ignition. Always keep the container closed. Dispose the carbouys after washing.